One of the more effective ways for you as an independent musicians to promote your music and discover new listeners is through your local independent record store. These stores and their customers are at the center of any healthy local music scene. Thus, they should be a key part of your music marketing strategy. As stated above, independent music retailers are generally at the core of any healthy local music scene. These stores don’t just sell music–they are cultural centers, acting as the proverbial water-coolers for any scene’s true music fans. Customers come to these stores as much for the experience as they do for the music, and the best of these stores deliver both in spades. Employees at these stores are not just High Fidelity-like music snobs , but they do know their music, and most are either actual artists themselves or tied into the local arts scene in some other way. These people eat, sleep, drink and breathe music, and as an independent musician, you need them on your side. These stores are active supporters or local music, promoting local shows to communities of active music consumers, writing about local bands via their websites & blogs, and selling music by local artists (generally via consignment). In other words, they are an independent musician’s best friend. That brings us to Record Store Day 2009, and an excellent opportunity for local musicians to support their local indie record stores. How? Book a gig at a participating store–As described above, almost every participating store will have live music performances on Record Store day, and you should be one of the acts! (In a quick informal phone poll of 10 participating stores during the afternoon of 3/9, 6 of the stores were still finalizing their plans, so there is still time!) Remember, though, that this is a gig to support your local indie store and local music fans, so don’t play the diva or expect payment. This is all about generating good karma. Even if they don’t have room for you to perform at their celebration, be sure to spend some time at your favorite indie record store on April 18th, 2009! 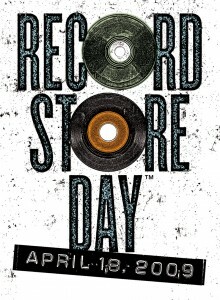 Now it’s your turn to share: how are you going to celebrate Record Store Day? Will you be performing at a local store? Dropping money on the original vinyl pressing of Black Flag’s debut? Picking up one of the many cool exclusive releases that the stores will have on 4/18? Tell everyone all about it in the comments!